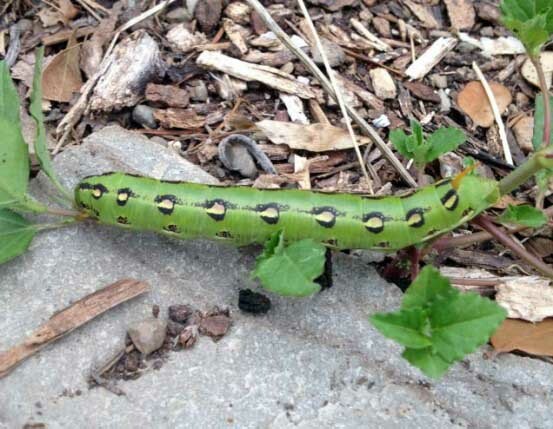 Have you seen this critter on your garden plants this season? Meet one of our favorite creepy crawlers, Hyles lineata. This imposing caterpillar will eventually morph into the beautiful white lined sphinx moth. Sphinx moths are often confused for hummingbirds in the garden, as their flight pattern and quick wing movement mimics that of a hummingbird. They are quite enjoyable to watch and are excellent pollinators. While the caterpillars can cause some damage garden plants they'll also munch on unwanted weeds, such as in the photo. Chemical control of these caterpillars is typically unwaranted, as you'll typically only find one or two in your garden. If they are munching on a favorite plant of yours, simply move them to the weeds! Keeping a balanced, organic landscape ensures that many beneficial pollinators, such as the Sphinx Moth, will thrive.